Making your own compost makes sense for a number of reasons. Firstly, your garden or allotment will need regular ‘feeding’ in order to allow the plants to flourish to their full potential. This nutrition can come from commercial fertilisers and compost, but inevitably it will cost you a fair amount of money. So the great thing about compost from your garden is that it is not only beneficial, but completely free to make. Essentially composting is a very basic and organic way of recycling. The benefit of having a few compost heaps is that you can make your garden waste into something useful, saving landfill space and trips to the Tidy Tip. A compost heap is also a thriving habitat for wildlife. There are already a range of commercial compost bins available, from the standard freestanding plastic bins, to the more expensive wooden crate-like structures and tumbling bins. However, these can be quite expensive to buy. 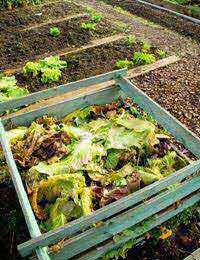 You should also take into account that ideally, you need two or three compost heaps to make compost properly. So buying enough bins will add up to a considerable sum. However there are ways to make your own compost heaps whilst keeping your budget relatively low. This article takes a look at one way to make your own compost heap in a frugally and environmentally friendly manner. A very popular method of making a compost heap out of recycled materials is to source wooden pallets. These sturdy structures can be used as compost bin sides, and you can opt to leave them as they are, or simply deconstruct each pallet and utilise the wood. The latter may be quite difficult and sometimes the pallets are nailed together and difficult to prise apart. Pallets are readily available from many building merchants, warehouses, garden centres and shops. Sometimes you may see them advertised as free, but sometimes it’s a case of approaching the outlet and asking if you can take as many as you need. You should bear in mind that blue pallets are reused and the property of a particular company. The pallets shouldn’t need treating, but they will need to be supported so that they don’t collapse in strong winds, or if the compost itself is building up lots of pressure on the sides. You can dig a small 4 to 6 inch trench on the soil where you intend to put your compost bin in the shape of the heap. Then dig over the soil underneath where the compost will go. This will help the worms work their way up through any compacted soil into the organic matter that you place on the heap. The pallets can then be placed in the trench – two pallets on the side and slightly higher at the back is all that is needed. The open front will allow you access to the compost to turn it, or transfer it to a new compost heap bin. If your pallets have spaces between the wood, it is a very good idea to line the bin on the inside with chicken wire. Make sure that the chicken wire reaches right down to earth level. This will help to prevent any vermin such as rats (who have no qualms about digging) making your new compost heap home! It will also help to contain the compost heap’s contents. The chicken wire can be stapled into place to keep it secure. You will probably need to secure the corners with galvanised wire too. You can then back fill the earth in around the trenched base and firm down. If you wish, you can use some old tarpaulin or carpet as a makeshift lid to your bin. This will help the heap to heat up, which in turn speeds up the decomposition process, making for a quicker turnover of garden waste to compost.